Size: 5.8" x 2.8" x 0.85"
The TI-60 Programmable Scientific calculator is identical with the TI-60 Advanced Scientific calculator. Texas Instruments changed the respective wording in 1990. Inside the calculator you'll find once again the two-chip design of most slanted calculators that allowed more features compared to the slimline series. Instead of the two TP0456 based chips of the TI-55-II you'll find here a TP0458 Master with a TP0456 Slave chip. Compare the TI-60 with the successor TI-60X and the later TI-68. 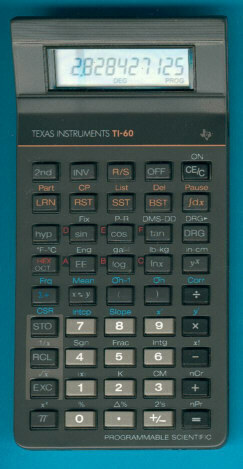 The TI-60 is featured in the Texas Instruments France SA leaflet ECD044F dated 1987. © Joerg Woerner, May 7, 2003. No reprints without written permission.